Clockwise from bottom left: Tommie Robinson, artist; Carolyn Mason, Balloon and Party Service; Keith Haywood, FDY, Inc. food service. Three sat at the speakers’ table. More just stood up in the audience. 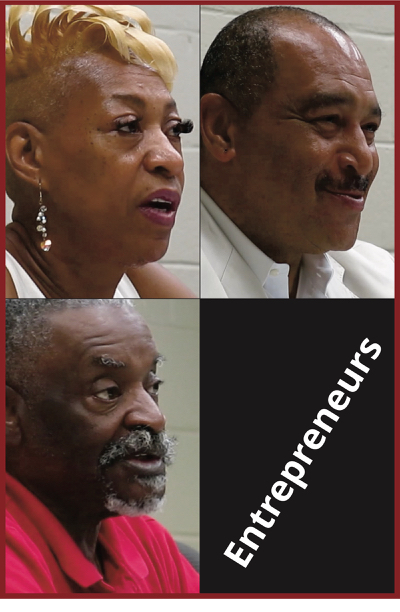 Tuesday’s Forum turned into a celebration of the entrepreneurial spirit that has propelled African-Americans into the middle class and opened up new opportunities in the community. Artist Tommie Robinson was most explicit about the reasons for his advocacy of entrepreneurial activity among young people: Without it, he said, blacks remain serfs to large enterprises, and likely will get the short end of the stick. Carolyn Mason’s messages included flexibility: Move to be accessible to your customers. Change with the times and new technologies. Keith Haywood’s work, focused on multiple dimensions of food service, included consistent delivery of quality. He knows: Tasty chicken is a foundation of his business, he told the group. Below as they are available are videos from the three main speakers’ presentations; a number of stand-up presentations from entrepreneurs in the audience; and the Q&A that followed the presentations. The list of entrepreneurs participating Tuesday: Carolyn Mason, Balloon and Party Service; Keith Haywood, VP Sales, FDY Inc. food service company; Tommie Robinson, artist; Dr. D. Franklin Freeman, Public Relations Group; Colette Forrest, People’s Voice Management Group; Blanche Penn, Winners Plus Agency; Vi Lyles, Vi Lyles Consulting; Cozzie Watkins, certified nursing assistant trainer; Dr. Gyasi Foluke, author and lecturer; Dr. Deborah Walker, Deborah J. Walker Consulting; Sean Gautam, PortfolioPro.com investiment advisers; Trymaine Gaither. After Hours Education Solutions; and Ken Koontz, WENS-TV, journalist, video producer. Q: How do you prepare to pass a business to the next generation? Q: What advice do you have for someone trying to move from being an employee to being a business owner? Q: Could CMS begin a food service prep curriculum? Its graduates would make more money than teachers.? Q: What would you say about the problem blacks have working together, or patronizing black businesses? Q: How do I start my business with no money? Q: The business literature says that if your business hasn’t created a profit within five years, it’s a hobby, not a business? Q: How important is it to you to spend money with other black businesses?